In chapter one of three, Tek Tan takes us through the workflow and thought process for modeling a cyberpunk character in 3D, using ZBrush and Maya. This 3D character will ultimately be painted over and presented in a finished illustration. This is the first of a three-chapter tutorial centered on how I produce my main character in 3D for my cyberpunk illustration. Modeling in 3D allows me to be less concerned about the fundamentals of light, shadows, perspectives, symmetry, materials, and camera angles, and instead focus more on workflow and time efficiency when illustrating. Said process also grants me more opportunities to experiment with different www.zpfl.netpositions and lighting schemes, and the final result tends to look better. The skills required to fully discern this tutorial is knowing how to use Photoshop, ZBrush, Maya, KeyShot, and understanding how shaders and rigging work. The main character – an asset for my illustration. She can be broken into parts and be utilized in other projects too. I wanted the setting of my illustration to be in an existing major city, and at the same time I wanted to avoid the familiar ones like New York, Tokyo, Hong Kong, or London. I did some research and chose Shenzhen instead; plus I really liked the sound of the name. My main character resides in this city and I wanted her to wear something that signifies the local culture while looking futuristic. I decided that she will wear a red qipao and have golden clippings and decorations in her hair. I made a quick concept art to show how she would look like in the final illustration. I usually skip this phase when doing personal work, but for client's work, this is essential. This took about 15 minutes. I like to base my designs on real life subjects alongside its real life www.zpfl.netponents. I avoid producing things that don’t exist in this world. So the first old asset that I will be using is my human body model which I first made in 2015, but modified and improved it occasionally throughout the years. Using this asset shaved off 5 hours of painting a human body by hand. The second asset I used were boots I made 3 months ago for a different project. 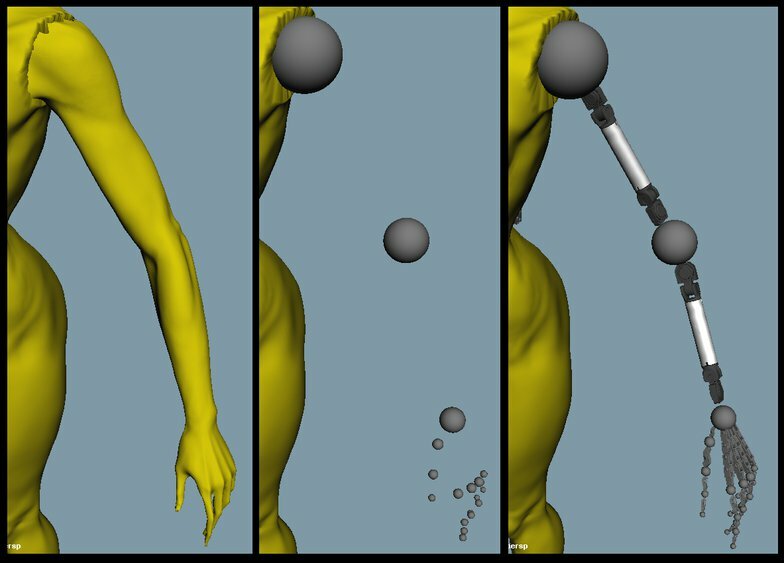 I wrapped around the anatomy of my model using the Move tool in ZBrush. I then remodeled and colorized them. Note that these are done very sloppily and quickly. I also unwrapped the UV and created its texture map from Polypaint in ZBrush. Boots process took about 10 minutes to get done. The material I had in mind for this was leather. Because my character is consisted of both hard and soft surface objects, I like to use Maya to model the former. Maya has this application called Hypershade which enabled me to create multiple different kinds of shaders and assign them to different meshes/planes. This makes dealing with rendering a lot easier later down the line. 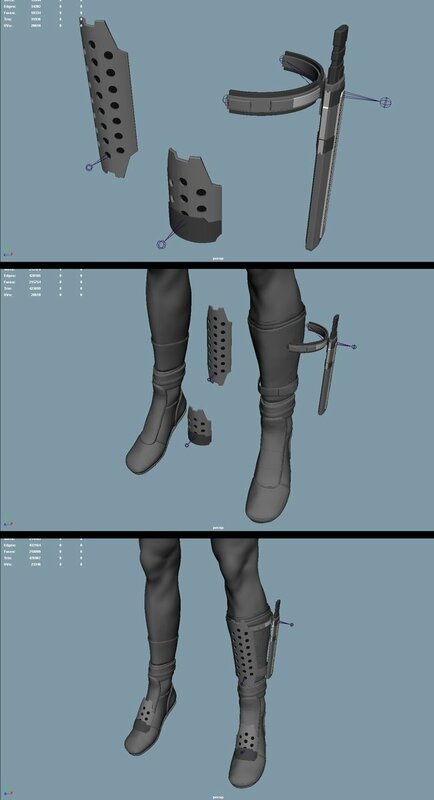 I modeled the shin guard from scratch but imported existing assets, like the knife and everything else. I 'parented' these models into 'skeleton' rigs so that I could easily move and rotate them around during posing. I put hard surface objects around the boots because I wanted them to look more interesting. This phase took about 20 minutes. When designing any kind of mechanical object, I think about real life excavators. They are made up of a metal foundation – attached to joints, they have hydraulics connected to wires, then powered by engines and ultimately covered with platings. That was the general gist of how I went about modeling the arm. First, I imported the character's low-poly arm mesh into Maya; this is meant for proportional references, so that I could avoid making the arm too large or too small, avoiding any clipping issues with the plating afterwards. Next I put in ball joints where the arm and hand can rotate. Note that I assign different shaders to different parts of the arm too. Next, I added some hydraulics, wires, and mechanical pieces around the hand. I try not to let them clip outside of the low-poly arm (which I could toggle its visibility). Then I added even more parts around the arm and fingers. I bought these kit-bash pieces from Vitaly Bulgarov's website. Then I went back into ZBrush, using Lasso Mask, Extractions, and Clip Curve Brush to make the platings. This phase was done quickly and sloppily but still took around 4 hours. I then auto-grouped the platings as a whole then exported them to Maya. The reason for auto-grouping is to have each piece of plating bewww.zpfl.nete its own mesh separated from the others. 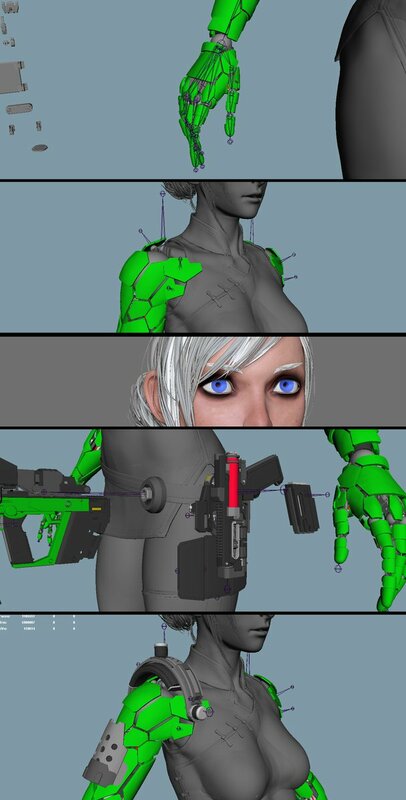 In Maya, I resized each piece and moved them about to have the arm look the best way possible. The fingers were initially too thick so I had to shrink them a lot. I tried not to make the arm look too futuristic by going overboard with the details. Just kept it simple. The qipao had to be modeled from scratch because I didn't have one in stock. I also had to research how it was made, as well as knowing what intricate details it had before modeling. This one was especially challenging because it had symmetry in one area but not in some others. I started from the neck then moved down to the hip area. I used Mask Lasso to select an area of the character's body, then 'extract' the area with thickness of 0.003. Next, I used the Move brush to sculpt the extracted piece into place. I then used Clip Curve to smooth the edges. The edges were then covered with almost black colored straps – made using Curve Strap Snap. I finished the qipao by unwrapping its UV, and then made its texture with polypaint. Note that the qipao is a low-poly mesh (200k vertices), and does not have subdivisions. Modeling this qipao took about 3 hours, and a lot of trial and error. Making the hair took about 30 minutes. One important advice that I have for artists is that you should have a reference beside you. Because if you sculpt hairs by instinct, your hair will tend to look too neat where every strand will flow towards the same direction - real hairs flow in all kinds of direction and are unpredictable. I used a total of 4 tools: the Curve Strap Snap to make the strands. The Move brush to move chunks of hairs. The Move Topological brush to move only a single strand. And the Smooth brush to shrink the straps down in size. On the Curve Modifiers option, I changed the root of the strap to be around 50%, the end tip to 0% and the body 100%. First, I laid down the straps, then subdivided them (more topology means better control). Smoothing the straps will make them thinner. Then I duplicated, followed by sculpting them with the Move brush. Next, I duplicated and sculpted again for more volume – you can repeat this step multiple times. 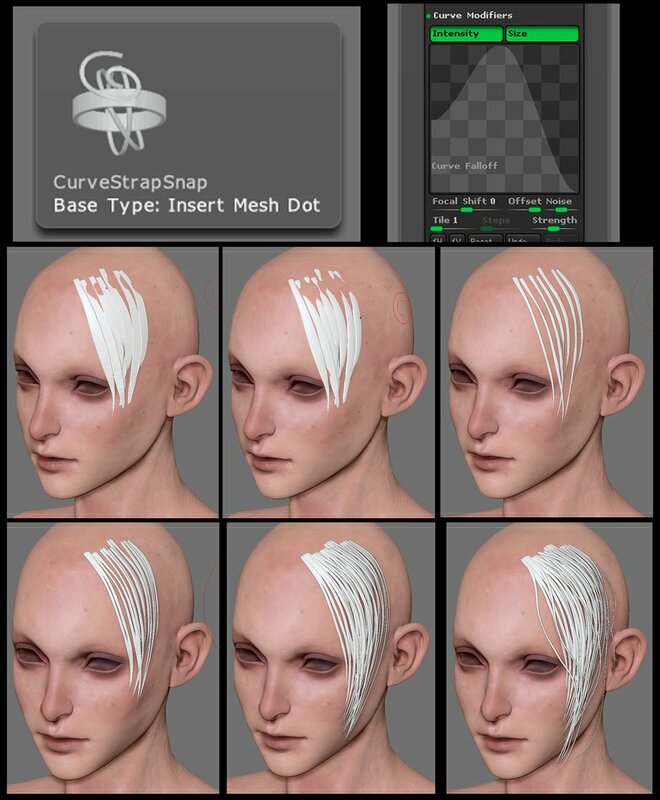 Then use the Move Topology brush to pull out a few strands so the hair has a more natural look. Finally, my character stops being bald. One important advice that I have for artists is that you should have a reference beside you. Because if you sculpt hairs by instinct, your hair will tend to look too neat where every strand will flow towards the same direction - real hairs flow in all kinds of direction and are unpredictable. 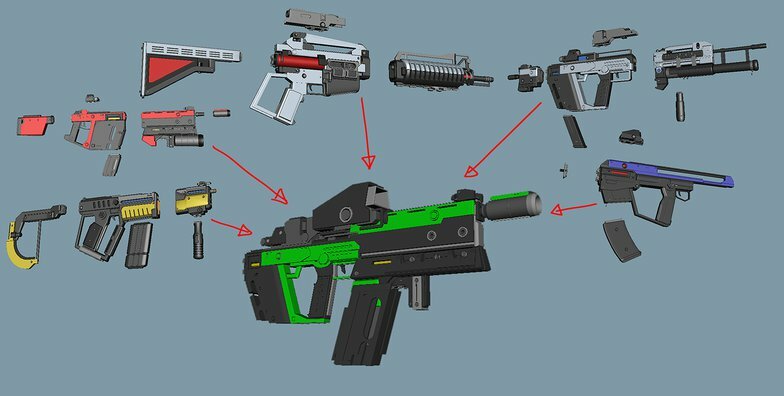 Because I’ve made some gun models in the past, I could kit-bash them into a new one in less than a minute. Note that these guns are modeled based on real life guns, so when I kit-bashed them to form a new gun, said gun will still possess the characteristics of a real gun, which is crucial if you want your audiences to know exactly what you just made. All the premade guns initially had different shaders assigned to their respective parts, and were not merged/www.zpfl.netbined. Once I was happy with my new gun, I did an overhaul to the shaders and had all the parts merged. My guns did not have its UV unwrapped and I did not paint them – I just managed the shaders. After all the essentials were made, I tried to indentify if there were any other things that I had not modeled or rigged, and then put them on a list and dealt with them one by one. I rigged the arm, hands, and fingers, then went back to ZBrush to sculpt some extra platings so that the robotic part transitioned nicely into her shoulder and qipao. I sculpted her eyebrows and gave her eyeballs. Then kit-bashed her holster, pistol and gun cartridges. I then kit-bashed an extra piece of gadget on her right shoulder. I did not think about what the purpose of this gadget was but it looked good on her. They way I did my rigging is to put the skeletons in place, then parent them to their respective models. The software that I used to render my models for this project was KeyShot. First, I imported all the models from Maya and ZBrush. The 3D model from the former could be imported in one big chunk because the shaders were different anyway, and I could assign KeyShot's materials into its respective shaders. 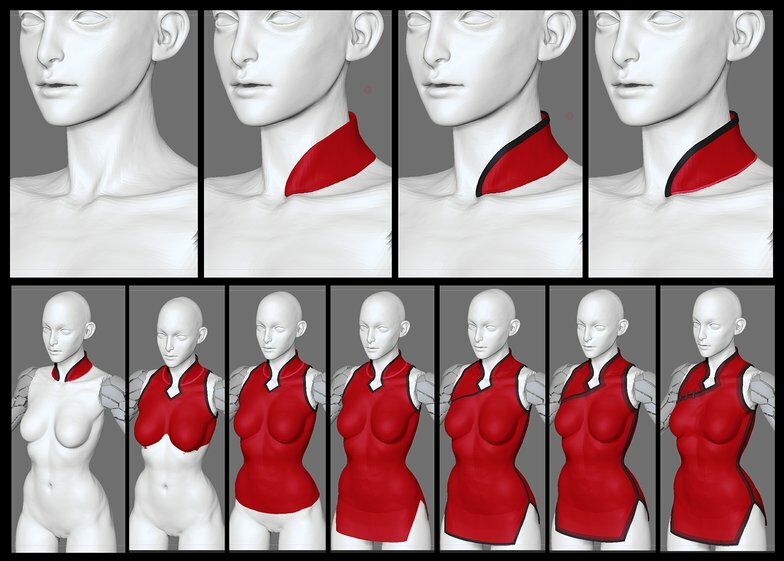 The soft surface models (character body, qipao, boots, eyeballs, hair) from ZBrush however had unwrapped UVs and texture maps, I therefore need to import these one at a time. After importing, I assigned some of KeyShot's existing shaders into my models. 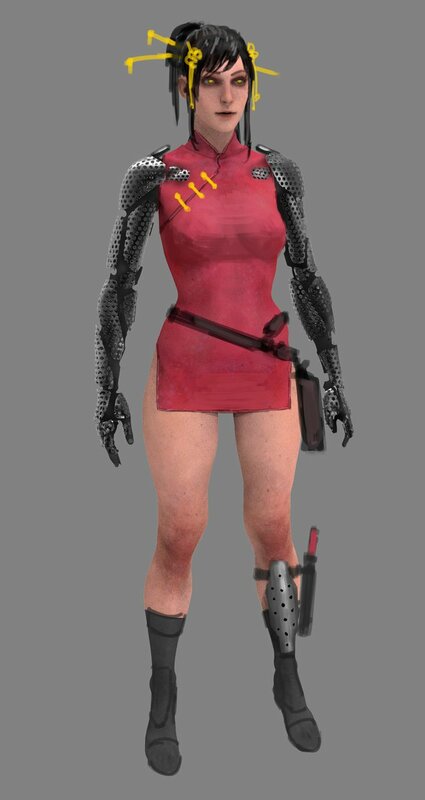 The body was assigned the skin shader, the qipao the cloth shader, the boots to leather, and so on. When choosing a background for the render, I tried to pick one that best suited the lighting scheme of my final illustration. I kept my 'camera perspective' between 43 to 50. Having the number too low – say 30 – would mess up the proportion of your character. I chose KeyShot as my renderer because of its ease of use. Based on my experiences, if you are making 3D models for paintover, try to put as much detail on your 3D models as possible, providing that it doesn't www.zpfl.netpromise your time though. It just makes things much easier when you paint over it afterwards. For instance, putting scales all over your dragon in 3D will take a shorter time and look better in the final than painting them one by one in Photoshop.